Dizengoff Nigeria, a member of the UK Balton Group, has been awarded the best tomato growing product in Nigeria 2014, by the Institute for Government Research Leadership Technology. The award recognises Dizengoff’s commitment towards supporting farmers across Nigeria, following world-class professional codes and ethical standard practices. Thereby increasing farmers yield in the production of fresh tomatoes all year round, using the Dizengoff Farmers Kit (DFK) otherwise known as the Greenhouse technology. Receiving the award on behalf of DIzengoff Nigeria, were the National Sales Manager –Agric Division, Kunle Dabiri and the Technical Manager, DFK, Oscar Walumba, at the Nicon Luxury, Abuja and was attended by members of the private sector, civil society, Non-Governmental Organisation and representatives from both Federal and State Government. Speaking at the award presentation ceremony, National Sales Manager – Agric Division, Dizengoff, Kunle Dabiri, said, “We are delighted as a company to be the recipient of the award, as the best tomato growing product of the year. This award is an incentive for our efforts and a testimony to the performance of the Greenhouse technology known as the Dizengoff Farmers Kit”. 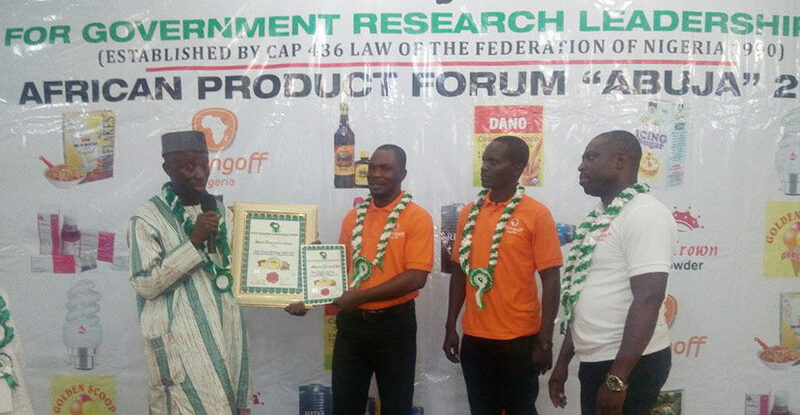 Kunle noted, that the award reinforces Dizengoff’s position as a trusted partner to the Nigerian farmers and stressed that Dizengoff will continue to strengthen its relationship with farmers through technical competence and professional advice. In presenting the award to Dizengoff Nigeria, Chief Executive Officer, Institute for Government Research Leadership Technology, Ambassador Moses Essien, urges the company to continue to uphold to government regulation, laws and guidelines, as well as making the greenhouse available and affordable to smallholder farmers and would be farmers. According to a 2011 report by the Federal Ministry of Agriculture and Rural Development, “Nigeria is the biggest tomato producer in Sub-Saharan Africa and the 14th largest tomato producer globally”, despite this revelation, lots of supermarket and hotels still import large tones of tomato into the country annually, from countries like South Africa, because they are not able to get high quality of tomato to sell, but with the quality of tomato produce in the Dizengoff greenhouse, lots of supermarket and hotels are already becoming off-takers for this farmers, thereby reducing their cost of importation.